SIG Manufacturing, forever located in Montezuma, Iowa, is among the ranks of a dwindling number of America's original model airplane kit and accessories makers and distributors. 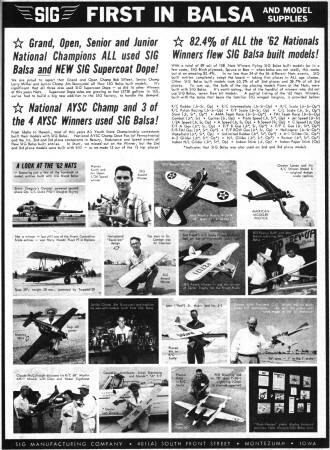 Sig's catalog from the early 1970s was the first hobby catalog I ever owned. You can bet I read it cover-to-cover many times, wishing to own everything on its pages. In case you don't know, the name SIG is a shortened version of Sigafoose, which is the last name of the company founders, Glen and Hazel Sigafoose. According to a press release, "In February 2011 SIG Manufacturing Co., Inc. was purchased by Herb Rizzo (President), David Martin (VP and General Manager), and Ron Petterec (VP). All three gentlemen are successful businessmen and lifelong modelers providing the ideal base for SIG to continue offering quality and value to model airplane pilots around the world." I have continued to order 25% nitro fuel and building supplies from them because their prices are amazingly good on many things. Check SIG's website; you might be surprised. Grand, Open, Senior and Junior National Champions all used SIG Balsa and new SIG Supercoat Dope! We are proud to report that Grand and Open Champ Bob Sifleet, Senior Champ Larry Miller and Junior Champ Jim Skarzynski all flew SIG Balsa built models. It's significant that all three also used SIG Supercoat Dope - as did 16 other Winners at this years Nats. Supercoat Dope sales are growing so fast (2750 gallons in '62), we've had to build a big new addition to the SIG factory, to handle the demand. National AYSC Champ and 3 of the 4 AYSC Winners used SIG Balsa! From Idaho to Hawaii, most of this years Air Youth State Championship contestants built their models with SIG Balsa. 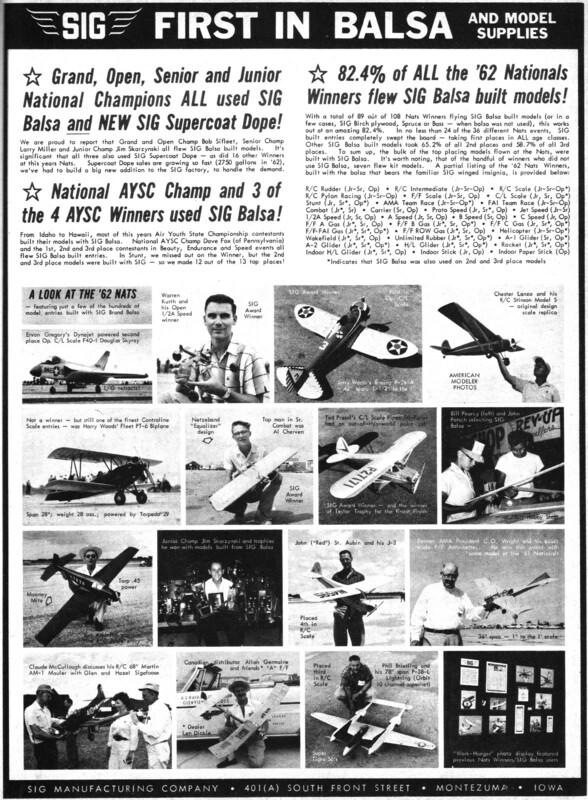 National AYSC Champ Dave Fox (of Pennsylvania) and the 1st, 2nd and 3rd place contestants in Beauty, Endurance and Speed events all flew SIG Balsa built entries. In Stunt, we missed out on the Winner, but the 2nd and 3rd place models were built with SIG - so we made 12 out of the 13 top places! 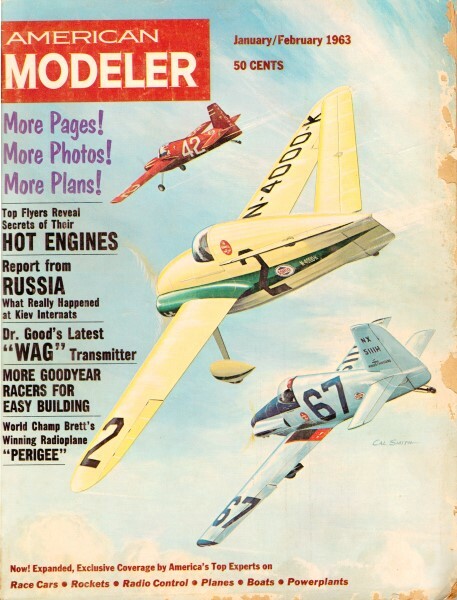 82.4% of all the '62 Nationals Winners flew SIG Balsa built models!